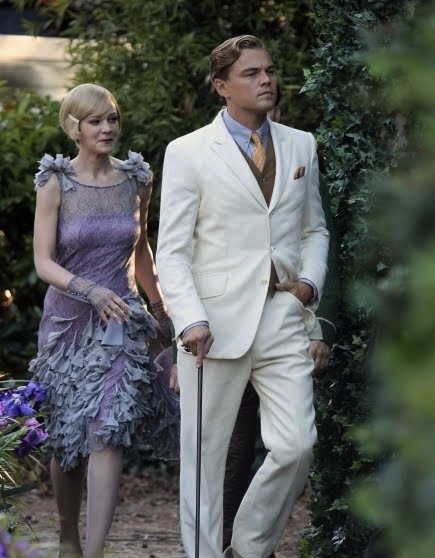 The Great Gatsby's latest rendition of the original novel by American novelist, F. Scott Fitzgerald is directed by Baz Luhrman—(who also directed Romeo + Juliet and Moulin Rouge!). The film stars Leonardo DiCaprio (as Jay Gatsby), Carey Mulligan (as Daisy Buchanan) and Tobey Maguire (as Nick Carraway). The wardrobe is designed by Prada—reflecting the attire of the ultra affluent in the post World War I era within the suburbs of New York in Great Neck, Long Island. The classic American novel is known for divulging a controversial, candid and vivid view of the rich: at times having a very distorted view of reality of feeling privileged, superior and above the law and then at times, seeming quite ridiculous, lost and vile. In October of 1922, F. Scott Fitzgerald did indeed move to a town called Great Neck in Long Island. The Great Gatsby will be out in theaters in the US, Europe and Australia in May of this year with a robust budget of $125 million.